The gaming scene in Malaysia is indeed a vibrant one – with the gaming market expected to grow 20% to RM868.7 million this year, and the region to grow by 30% in 2018. This leads to Malaysia being the 26th largest gaming market in the world and the third largest in Southeast Asia, reflecting the country’s potential to become a regional gaming hub by 2025. As the fastest growing region in the games market, Malaysia is the second biggest in the mobile games market, partly influenced by the fast-rising (mobile) internet connectivity. In this battleground to introduce devices that satisfies the appetite of today’s power users and gamers, it is ever so important that global smartphone players pay attention to the trends in order to meet market demand. As smartphone buyers this year look forward to phones that are thinner, faster and with better graphics to keep up with the demand for mobile gaming, the introduction of the honor 8 Pro into the Malaysian market is a timely one for honor Malaysia. Malaysia, being the first international market to introduce the honor brand outside of China in 2014 have since seen a rapid uptake in brand recognition by the local consumers. Prior to introducing its high-quality devices in the market, the brand invests greatly to understand the local market taste, lifestyle, budget and demands – and the brand recognised the growing need for a mobile gaming smartphone. This came to no surprise for honor Malaysia as it realised the uprising trend of eSports in the country through its various focus groups with mobile gamers to understand their passion in gaming as a career. 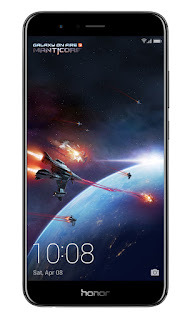 With its strong emphasis on quality, innovation and open collaboration with global partners, the honor 8 Pro is a proud testament of the brand’s success where it has engineered a device that addresses the needs of this region’s power gamers, so much so, honor has regarded the honor 8 Pro as the flagships super smartphone in terms of its performance. Geared with the octa-core Kirin 960 chipset which raises CPU processing by 18% and the Mali-G71 GPU which exceeds its predecessor in graphic rendering by 180%, the honor 8 Pro leaves its user with a smooth gaming experience and transition between apps and games. Accompanying its cutting-edge performance is its graphic processing by Vulkan API, which enables the most demanding games to run at high frame rates with minimum lagging, all fitted in its ultra-thin 6.97mm metal body. The performance heavyweight honor 8 Pro was made the official gaming smartphone and exclusive partner for the highly-popular mobile game, Mobile Legends for the first-ever Mobile Legends South East Asia Cup 2017 in Malaysia recently. The selection criteria for being the official gaming smartphone for this tournament was to ensure players were able to run the most demanding games at high frame rates with minimum lag and dropped frames. The reason for speeding up mobile devices is to allow them to run heavy applications like virtual reality. With a smartphone that costs only RM1,999, the honor 8 Pro comes VR-ready, bundled with a cardboard viewer and pre-installed with the Jaunt VR application which contains a wealth of VR video content. With its 5.7-inch Quad HD display, capable of delivering an immersive cinematic display nearing the Hollywood cinema standard of colour accuracy and detail, mobile gamers are set for a whole new dimension of mobile gaming.